Air mattresses have a variety of uses. They can be used inside for overnight guests or outdoors while camping. 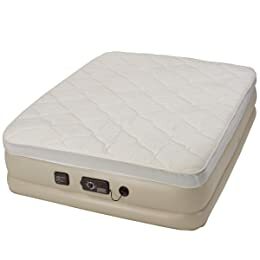 They’re also great as temporary beds when you move into a new place, and some people even use them for everyday sleep, finding them to be more comfortable than traditional mattresses. Most air mattresses are designed for temporary, intermittent use, but that doesn’t mean you should settle for an inferior one. Air mattresses come at all price points, and it’s worth it to get the nicest one within your price range. Your back will thank you. There are a few factors to take into consideration when choosing an air mattress. You should aim to buy a mattress that’s unlikely to leak overnight, easy to inflate/deflate, and comfortable while you sleep. You should also consider the height of the bed, the type of material used for padding, and whether it includes a built-in pump or not. Here, we’re featuring 5 of the best rated air mattresses, chosen based on a few of these important criteria. We chose our picks based on their great quality and high user ratings. SoundAsleep’s air mattress has a blue top with a beige body. 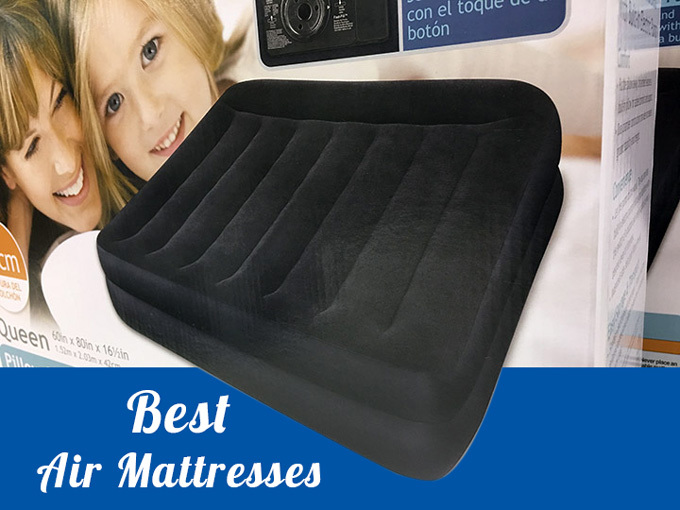 It’s a high quality air mattress with built-in pump, which is easy to use with just one click. It inflates quickly, and is quite easy to deflate. This is a queen air mattress, which is a perfect size for one or two guests. The mattress also has material on the bottom to grip the floor and prevent slippage. The top layer is waterproof and includes coils designed for your comfort. 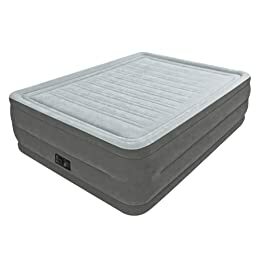 Some downsides of this mattress include that it can feel cold to the touch and is somewhat heavy, so it’s not ideal for carrying from place to place. However, users say it’s comfortable even for several days of sleeping at a time. The Intex queen air mattress is an affordable and comfortable option. It comes with a built-in pump, and inflates relatively quickly. It has a high weight capacity and a waterproof top layer. Some users say this mattress can become leaky overnight, but most have had great experiences with this reasonably-priced airbed. This mattress is great for those who like a firmer bed. The Intex mattress also has other benefits, such as a built-in pump that makes the inflation process foolproof. Some users say it’s difficult to completely deflate this bed, and it can take a while. We recommend this bed for longer-term guests for that reason. 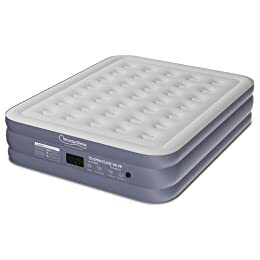 The Serta air mattress has a unique feature: it has not just one pumps but two. The additional pump is designed to keep your bed automatically inflated all night long, monitoring any changes in air pressure and fixing them without any effort on your part. Not having to wake up to re-inflate your air mattress is every houseguest’s dream, so users love this feature. In addition, you can customize the firmness level of this mattress so that it’s most comfortable for you. This mattress comes in twin and queen sizes. It has a tall height and is comfortable to sleep on. The main complaint from users was that when the extra pump comes on at night to refill any lost air, it can be noisy and distracting. If you’re a light sleeper, this may not be the mattress for you. It can be hard to find a comfortable air mattress that’s lightweight enough to be used for camping. Many mattresses are either too heavy or flimsy and uncomfortable. 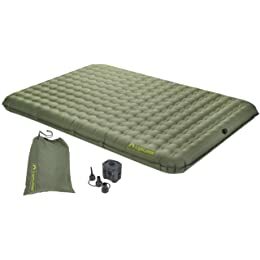 This is our pick for the best camping air mattress, the Lightspeed Outdoors camping airbed. It weighs just 6 pounds, packs up compactly, and comes with a built-in battery-operated pump. It’s still too heavy for backpacking, but is perfect for car camping. Like many air mattresses, it does tend to feel cold to the touch. Especially during cold months, you’ll want to make sure you bring plenty of blankets to put between you and the cold mattress. This bed comes in multiple sizes and colors, and is sold at a reasonable price. Our top pick for the best inflatable mattress is the WonderSleep portable air bed. This mattress is a great “all-around” pick: it’s not too expensive, but is still high-quality and will work well for a variety of indoor uses. It’s tall, comfortable, and quickly inflatable. This mattress features a reinforced, slide-proof bottom and waterproof top layer. It also has an internal built-in pump for easy, no-fuss inflation. This is a queen air mattress. Many air mattresses are prone to leaks; it’s often a constant battle to keep them at the same level of inflation night after night. Users love that this bed actually stays inflated night after night, without needing to add much air. It features triple-sealed seams and puncture-proof material. Users say that this mattress can be difficult to re-pack into its storage bag, and doesn’t fold up very compactly. However, if you have closet space and need a solution for regular houseguests, this one is a comfortable and reliable choice. It can be difficult to find a blow up mattress that’s durable and comfortable. 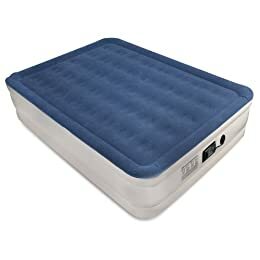 There’s so much that can go wrong with an air mattress, including leaks, punctures, and squeaky noises while you sleep. It’s important to do your research and find a mattress that excels at its job, one that you can simply inflate and forget. These are our picks for the best air mattress brands because of their high user reviews and high-quality materials. Whether you need it for occasional guests, a new apartment, or camping, one of these mattresses is sure to meet your needs.